Curated by Justin Hinder & Anna Louise Richardson. Telltale is a writing and exhibition project centred on a narrative conceived by ten artists, written by Justin Hinder and explored over a series of collaborative workshops and studio sessions. In pairs, they have created a suite of works including paintings, ceramics, video and drawing, that interpret and respond to the stories built up around the mythical hotel Telltale Grande, where some guests are destined to stay forever. Featuring artists Kate Knight and Kate Just, Eden Menta and Richard Lewer, Paul Hodges and Georgina Cue, Mark Smith and Chili Philly, and Megan Sloan and Katherine Hattam. Telltale explores the dusty corridors of a once majestic hotel, steeped in the echoes of a mysterious past: a place where lovelorn ghosts float through tumbling children, a place where laughter, tears, breakfast and booze blend a heady cocktail of comic tragedy. Telltale was developed through Next Wave’s Emerging Curators Program with Arts Project Australia for Next Wave Festival 2016. Arts Project Australia for Next Wave Festival 2016, Melbourne, VIC. 7 May – 11 June 2016. Justin Hinder an artist, writer and curator based in Melbourne. His practice investigates human movement and the decision-making process combining daily normalities with ideals of pre-determined destiny and storytelling. Hinder is participating in SafARI’s emerging writers program 2016 and working on an upcoming solo exhibition with This Is No Fantasy + Dianne Tanzer Gallery (VIC). Hinder is represented by This Is No Fantasy + Dianne Tanzer Gallery (VIC). Kate Knight (born 1974) is an emerging artist and has worked at Arts Project Australia since 2008. She has been involved in numerous group exhibitions including Melbourne Art Fair (2012-2014), Royal Exhibition Building, Melbourne; Turning the Page, Gallery 101, Ontario, Canada; and World In My Eyes, C3 Gallery, Abbotsford. Knight is represented by Arts Project Australia. Kate Just is a Melbourne based artist based primarily known for her knitted sculptural works and socially engaged, public feminist art works. Just has exhibited extensively across Australia in solo and group exhibitions. She won the Wangaratta Contemporary Textile Prize in 2015, the Rupert Bunny Visual Art Fellowship in 2014 and the British Council Realise Your Dream Award in 2013. Just has held residencies at KREMS (AIR) in Austria, the Australia Council Studio in Barcelona, Youkobo Art Space and will undertaken an Asialink residency in New Delhi in 2015. Just has work in public and private collections including the National Gallery of Australia and has been a lecturer at the Victorian College of the Arts since 2005. Kate Knight & Kate Just, Telltale Grand Shenanigans, 2016, stop motion video (still), 2 minutes 49 seconds. Eden Menta (born 1994) is an emerging artist with a drawing, painting and digital art practice. She has worked at Arts Project Australia since 2013. 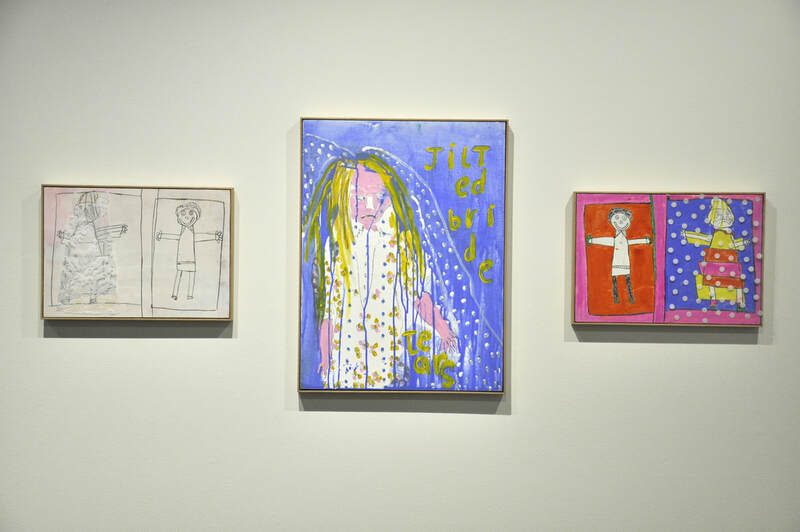 Since this time she has exhibited annually at the Arts Project Australia gallery as well as in group exhibitions at Brunswick Street Gallery, Melbourne (2014, 2015), and No Vacancy Gallery, Melbourne (2014). Menta is represented by Arts Project Australia. Richard Lewer is a New Zealand born artist based in Melbourne; Lewer won the Albany Art Prize, 2015, Blake Prize, 2014 and The Black Swan Portrait Prize, 2013. Lewer is represented by Hugo Michell Gallery (SA) and Sullivan+Strumpf (NSW). Eden Menta & Richard Lewer, Anthony, 2016, acrylic on canvas, 61 x 46 cm. Eden Menta & Richard Lewer, Dont Tease The Special Needs, 2016, acrylic on canvas, 61 x 46 cm. Eden Menta & Richard Lewer, Elizabeth, 2016, acrylic on canvas, 61 x 46 cm. Eden Menta & Richard Lewer, Ranga, 2016, acrylic on canvas, 61 x 46 cm. Eden Menta & Richard Lewer, Wog, 2016, acrylic on canvas, 61 x 46 cm. Paul Hodges (born 1974) is a painter and ceramicist. He has worked at Arts Project Australia since 1998 and presented his first solo exhibition Hello Sailor at Arts Project Australia in 2015. He has been included in numerous group exhibitions including, Melbourne Art Fair, Melbourne and National Gallery of Victoria 150th Anniversary, Melbourne. In 2005 his work was selected in the 2nd Annual Intuit Show of Folk and Outsider Art in Chicago, hosted by Phyllis Kind Gallery, New York. His work is held in private collections throughout Australia. Hodges is represented by Arts Project Australia. Georgina Cue was the recipient of an Australia New Work Grant - Early Career, 2014 and JUMP Mentor program, 2013 to work with Damiano Bertoli. Cue has work in public collections including the National Gallery of Victoria. Paul Hodges & Georgina Cue, Wedding Cake, 2016, glazed ceramic, 44 x 26 x 26 cm. Paul Hodges & Georgina Cue, Cigar Case, 2016, glazed ceramic, 4 x 15.5 x 10.5 cm. Paul Hodges & Georgina Cue, Whisky Glass, 2016, glazed ceramic, 8 x 11 x 10cm. Paul Hodges & Georgina Cue, Rolex, 2016, glazed ceramic, 7 x 6 x 4cm. 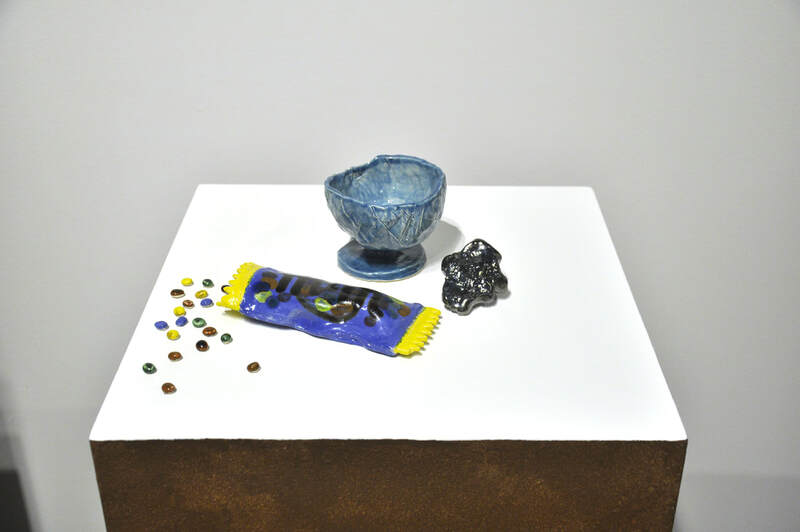 Paul Hodges & Georgina Cue, Sweet Treat, 2016, glazed ceramic, 17 x 7 x 3cm. Mark Smith (born 1976) is an emerging artist that works across a range of mediums. He has worked at Arts Project Australia since 2007 and had his first solo exhibition Words Are… at Jarmbi Gallery Upstairs in Upwey, Victoria. He has exhibited in multiple group exhibitions including Small Universe at No Vacancy Gallery, Melbourne, and My Puppet, My Secret Self at The Substation, Newport. In 2014 he self-published Alive, an auto-biographical reflection of his life. Smith is represented by Arts Project Australia. Chili Philly is an artist based in Melbourne. Chili Philly has 128K+ instagram followers for his images of knitted novelty hats, generally of food and has been featured in editorial including Frankie Magazine, BuzzFeed, Huffington Post, Daily Mail, SBS Food, BBC, i-D and Seven News. 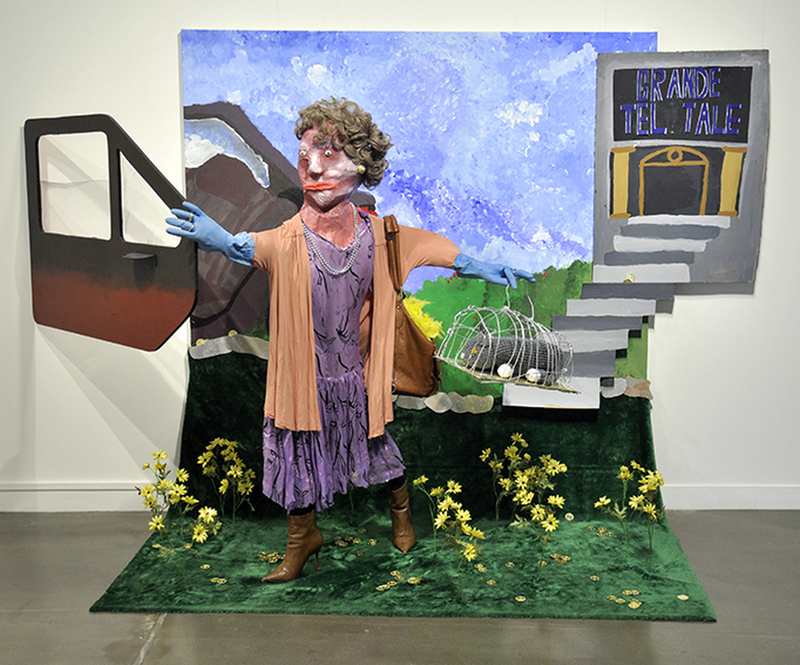 Mark Smith & Chili Philly, Ms Scott and Pookie, 2016, mixed media, 102 x 290 x 105 cm. Chili Philly, Cat Hat, 2015, wool, 35 x 25 x 35 cm. Megan Sloan (born 1993) is an emerging artist and has worked in the Arts Project Australia studio since 2013. Working in a variety of mediums, she has a distinctive sense of composition and line. Sloan’s work often depicts the world of fantasy and features subjects from ancient mythology such as goddesses, heroines, kings and queens. She has been featured in several group exhibitions at Arts Project Australia. Sloan is represented by Arts Project Australia. Katherine Hattam is an artist based in Melbourne. 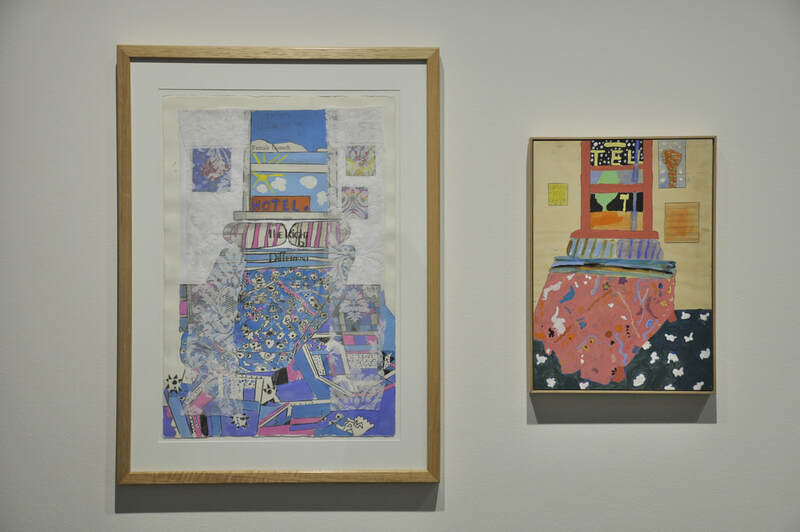 Hattam has exhibited extensively across Australia and has works in many Australian public collections including the National Gallery of Australia, National Gallery of Victoria, Queensland Art Gallery and Artbank. Hattam is represented by Daine Singer (VIC). Megan Sloan & Katherine Hattam, Portrait 2, 2016, cloth, gouache and graphite on board, 29 x 41 cm. Katherine Hattam, Jilted Bride, 2016, gouache and graphite on board, 61 x 46 cm. Megan Sloan & Katherine Hattam, Portrait 1, 2016, cloth, gouache and graphite on board, 29 x 41 cm. Megan Sloan & Katherine Hattam, Not titled, 2016, gouache and graphite on board, 46 x 61 cm. 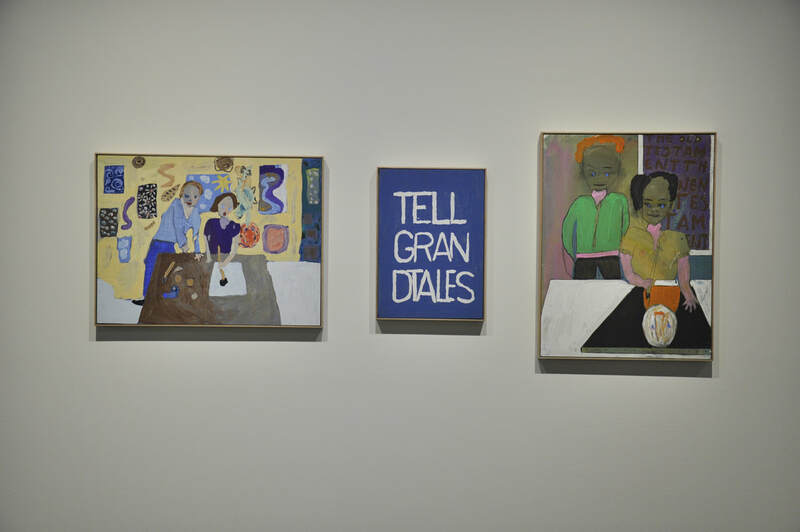 Katherine Hattam, Tell Grand Tales, 2016, collage, gouache and graphite on board, 41 x 29 cm. Megan Sloan & Katherine Hattam, Not titled, 2016, gouache and graphite on board, 61 x 46 cm. Megan Sloan & Katherine Hattam, Bedroom, 2016, collage, gouache, graphite and ink on paper, 56 x 38 cm. Megan Sloan & Katherine Hattam, Bedroom, 2016, gouache, graphite, watercolour and paint on board, 41 x 29 cm. Megan Sloan & Katherine Hattam, ​Hotel bedroom, 2016, collage, gouache, oil pastel, paint, pen on paper, 110.5 x 119 cm. Magen Sloan & Katherine Hattam, The Old Testament The New Testament, 2016, gouache on board, 61 x 46 cm. Megan Sloan, Not titled, 2016, glazed ceramic, 29.5 x 15 x 13.5 cm. Megan Sloan, Not titled, 2016, glazed ceramic, 20 x 18 x 3 cm. Photography: Penelope Hunt. Courtesy of the artists.